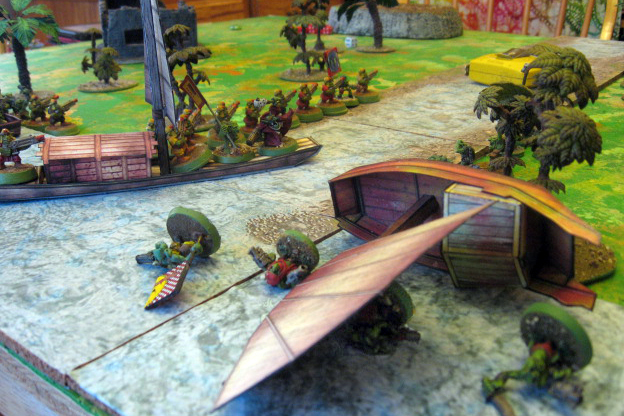 The battle had gone poorly for the Marauders and whole companies of their stuntie troops had begun to flee. 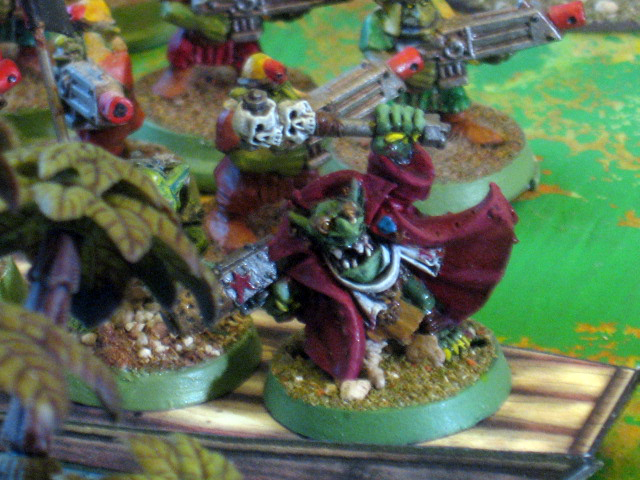 One group, led by the Red Gobbo himself, was determined to steal the transports and sneak off to start a new stuntie commune in a distant corner of the galaxy. 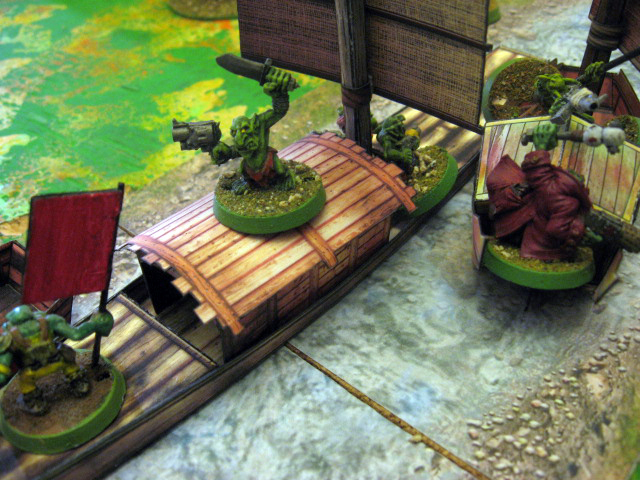 However, another group of stunties was despatched to secure the transports and stop the traitors from escaping. 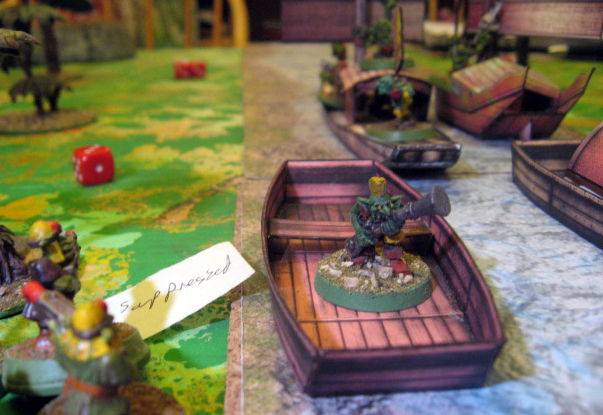 Object of the game; Get the boats, kill those other stunties! 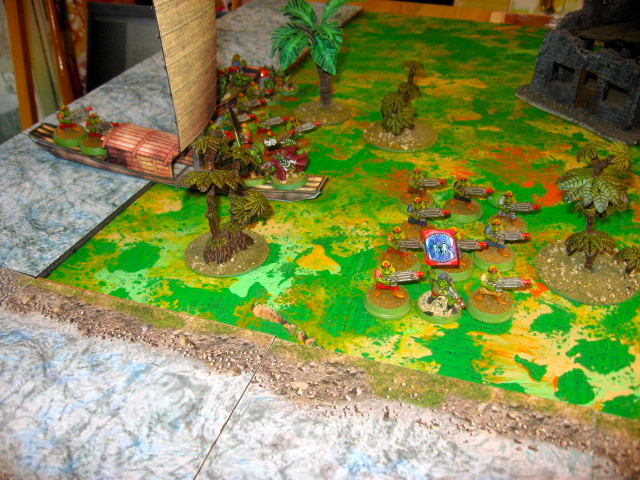 My older brother and I played our first game of Warpath (ver. 2.0 Beta) by Mantic Games last night. Each of us had three squads of ten Stunties with Stuntie guns led by a Big Stuntie with a pistol. The Big Stunties just used a basic Marauder trooper profile but Inspiring was substituted for Crushing Strength. The points values of these forces are about 125pv for each side. Both sides form firing lines on the riverbanks and blaze away at each other. These guys are probably the worst troops in the galaxy, they make stormtroopers look like marksmen. 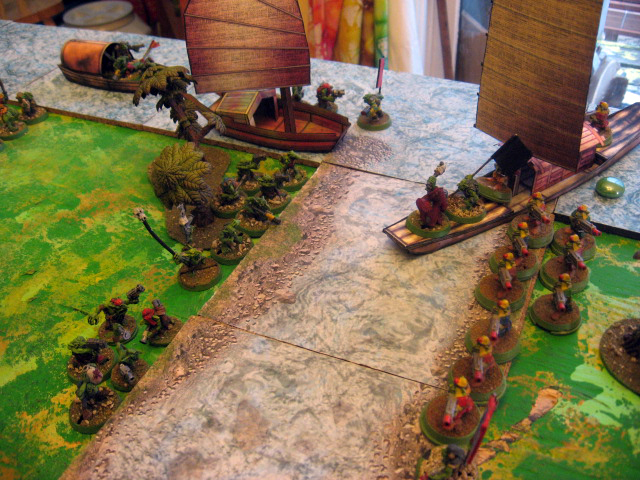 Both sides try to navigate their vessels through the firing lines, some with disastrous capsizing results. Probably a third of the casualties in this game were from drowning. 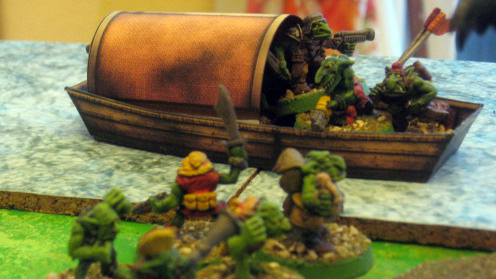 Not all the troops in a squad could safely fit in a boat so usually half the squad would keep pace on the riverbank with the boats staying close enough to shore to maintain squad coherency. As the ships made their way down the narrow river they began ramming and boarding each other, which led to more capsizing. 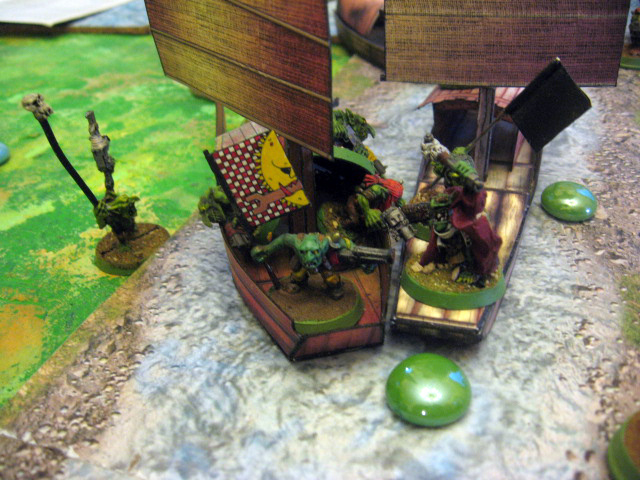 The Red Gobbo jumps ship after his crew dies around him. He was sent to a watery grave shortly after this by the loyalist Stuntie commander after a victorious round of hand-to-hand combat. 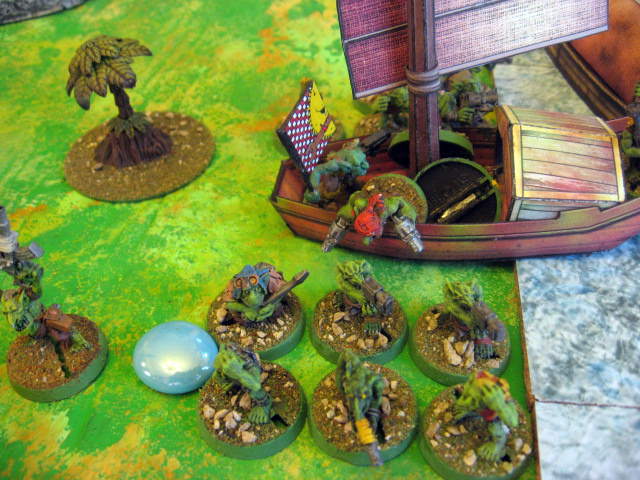 The remaining rebel stunties were suppressed and taken prisoner by the mohawk and musket stuntie, the sole survivor of his squad. It was a fun, grueling death by attrition (seriously awful troops all around), first experience with Mantic’s Warpath 2.0 rules. 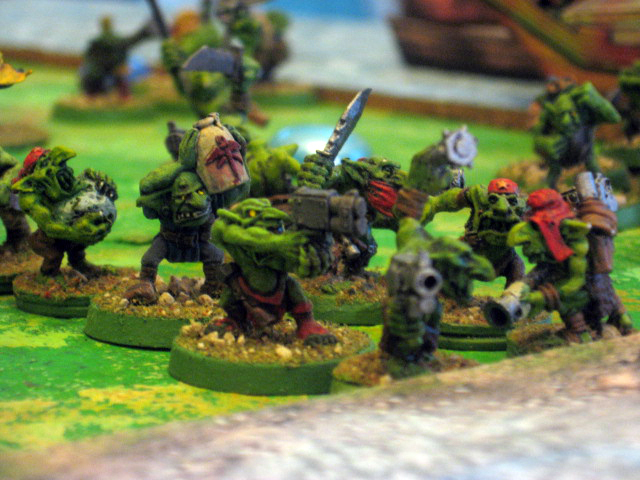 I have some questions about little things in the rules (can individuals join squads?) that I need to re-read the rules and dig through their forums a bit for enlightenment. Decent set of rules though and they are available free from their website. 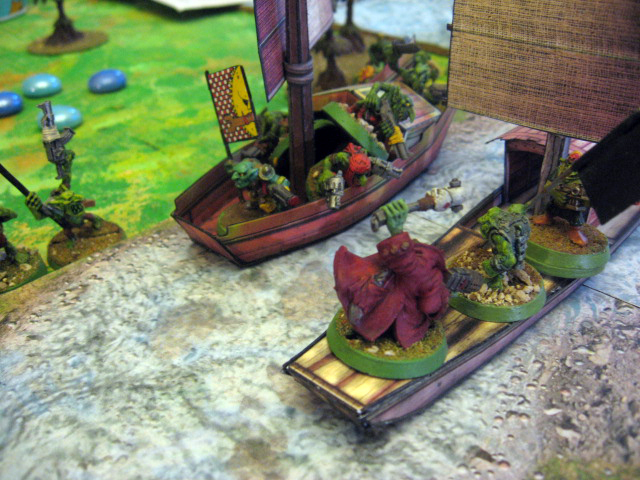 Product placement; Dice tower by Litko, river tiles by Fat Dragon Games, and sampans by Mayhem in Paper (me!). 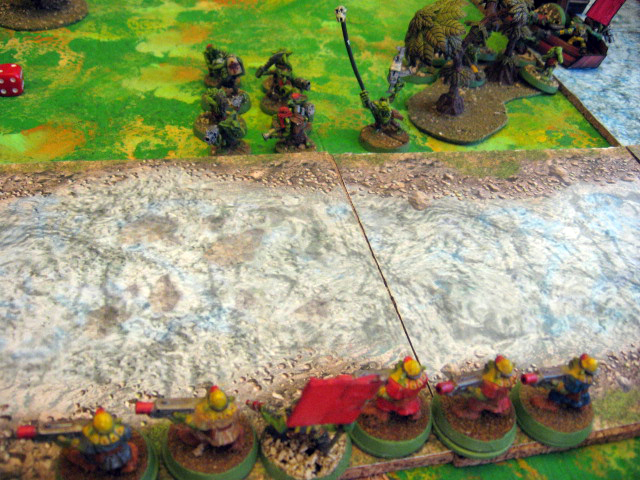 This entry was posted in Battle Reports, Miniatures and tagged Gretchin, Mayhem in Paper, Red Gobbo, sampan, Warpath on May 16, 2013 by squirmydad. 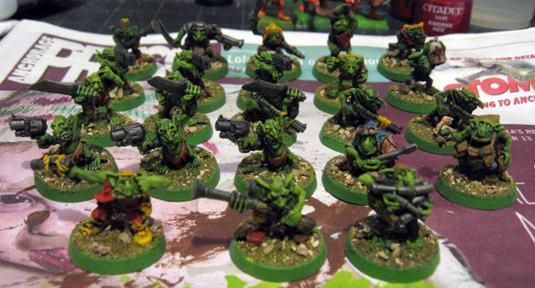 My older brother and I have been churning through my pile of unpainted 40K Gretchin minis the past few weeks, he painted 15 and I painted 8 so that puts me up to 63 painted Gretchin. 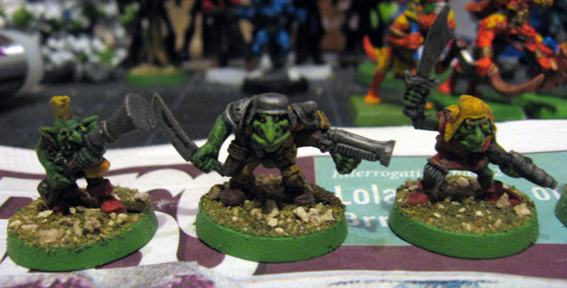 My goal is to finish all of the unpainted Gretchin on my table, which would put me over 100. 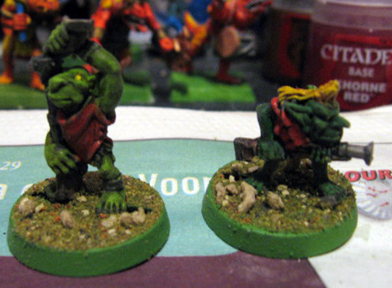 We both started from a black primer coat and did the skins in basic goblin green color; he did his solid and I dry-brushed mine on to keep the shading in the recesses. I went for solid color fills with a very small subdued palette-mostly browns, metal, little blue, little off-white. 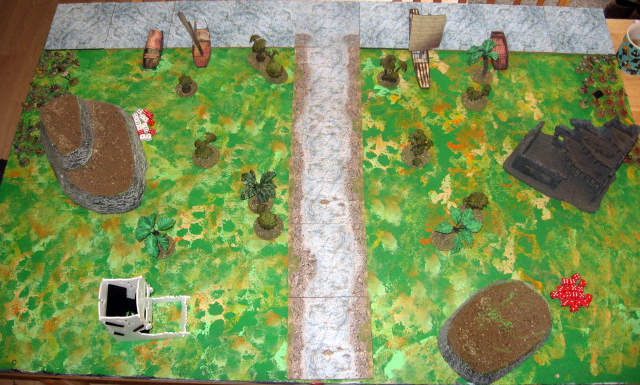 My brother used oranges, yellows, reds, metals, blue and purples with ink washes* (green, orange and yellow) to darken or brighten the base colors. Once we both had our basic colors finished they were all dipped in Tudor Satin polyurethane stain, allowed to dry overnight then matt-sprayed to knock off the shine. You can paint on top of matt spray as it is clear acrylic, can’t paint on top of un-matted polyurethane though-the paint slides around a lot. The rets of the Gretchin Horde will have to wait a bit as I am switching over to finishing some Lizardmen and some palm trees terrain. 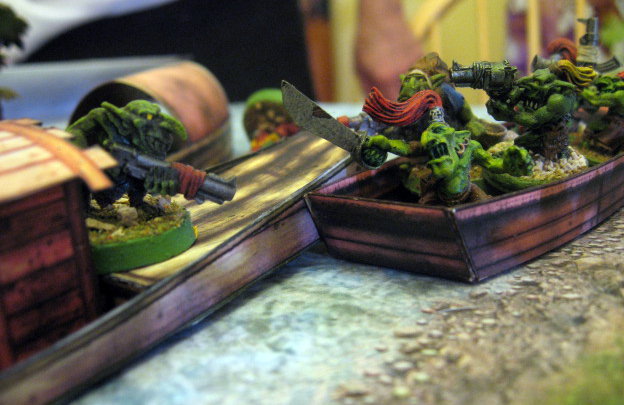 This entry was posted in Miniatures, Painting and tagged Gretchin, Paint, Polyurethane on April 21, 2013 by squirmydad.